Cool Decals, Family Stickers, Vehicle Graphics. Create a Family Sticker. TWO RANDOM FREE DECALS PER ORDER. Online Sticker Catalog. Order Car Truck Boat Trucker Vinyl. Custom Sized Graphics and Lettering. Full Intensity Grafx BLOG | Order Monogram Decals | Order World and State Flag Decals | Order Zombie Family Stickers! See NEWS at page botton or details here: What's NEW! Cool Decals, Family Stickers, Custom Lettering, and MORE! "When you want the best"
Order Decals made in the USA with Oracal 651 series 6 year vinyl! Myriad options, DAILY SHIPPING! Quick customer service and TWO DECADES EXPERIENCE! Order decals from the grandest most awesome selection of designs: THE MEGA DECAL CATALOG! for Cool Decals or customizable stickers. Order family stickers, "In Loving Memory" Decals, Greek Letter Decals, Monogram Decals, and custom text decals online with myriad options, vivid vinyl colors, large or small sizes. You can also order car or truck magnetics signs for business. With over 200,000 plus graphics here on the website alone and almost a million plus in stock we invite you to experience why we are different from the rest. Preview your own custom text online with hundreds of fonts and styles and create a custom text sticker online! You can get what you want, shipped right to your door, quick! We pride ourselves in professional courtesy and honest customer service. We welcome you too give us a chance to earn your business...we promise, you won't be dissapointed. Please check with us often as we update the site almost every day! How can I get a FREE decal sample pack? Just Seach Google for "Cool Decal" and Full Intensity Grafix will pop up first online! Note! We do not sell copyrighted designs or logos. I make a strong effort to keep any graphics I know are copyright designs out of this catalog. If you see any that I missed and need to remove please let and I will delete asap. It is possible that not all items seen are available for sale. Most designs are from licensed collections or drawn by Full Intensity Grafx in house. Create a Family Sticker Here Online. EASY & FUN! Order a family decal sticker for car minivan truck or laptop case. Apply to almost any smooth surface! Order online today. It has never been easier or more FUN to order online! Create your custom stick Family Stickers Online! You can choose from 100's of different stick figure members and add and remove them from your family decal with a click. After creating you will get a preview of how the family sticker will look and a choice for an optional sample proof of the family sticker before we create it. SUPER EASY - MEGA SELECTION - MYRIAD OPTIONS & VIVID VINYL COLORS. Also order our Full Color Family Stickers Online here! The same cool decal in a full color version. All stickers are made in the USA with 6 year Oracal vinyl. See the: Dads | Moms | Boys | Girls | Babies | Grandparents | Pets | ...Extras? Quick navigate to the style of your choice! Block & Bold | Bloody & Dripping | Chino & Oriental | Cowboy & Western | Decorative & Old English | Digital & Computer | Euro & Sporty | Fire & Flame | Grafitti & Tagger | Ice & Cold | Jagged & Rough | Kids & Scribbles | Misc & More | Script & Cursive and last but not least Wacky & Wild! Big discounts for quantity or bulk orders. Feel free to contact us or see the FAQ for more info. Order cool Vehicle Graphics online! Thousands of styles to choose from including flames and fire graphics, tribal and racing checked flags, pinstriping designs, splashes and boat grafix, and more. Set your ride apart from the rest. You boat or truck or car is your own personal canvas, make it come alive! One can hardly believe the change it makes from a plain ride, and you'll be able to find it in the parking lot! One of the great things about vinyl decals and vehicle grafix is that they are relatively easy to apply compared to paint, they last a long time, and best, they are changeable. You can change the look of your vehicle car truck boat semi or van every year if you want. Just change the vinyl decals. Affordable prices for quality Oracal 651 series 6 year vinyl. Browse our mega selection, order today and have it at your door in no time. Feel free to contact me with any questions. Choose from dozens of high quality vivid popping colors from matte black or white, to bright popping greens yellows and reds. Also wew carry metallic vinyl in a few select colors and neon florescent vinyl for stand out short term promos and advertising stickers. From storefronts to back window glass decals, it's there for you, one stop one shop! Order a vinyl decal online today! Many vivid and bright Vinyl Color Choices and custom size options for all the decals in the main decal catalog, family stickers, custom text decals and vehicle graphics. Most vinyl is Oracal 651 series 6 year and is made in the USA. Powerful order decal options: enter your own custom size, squish and stretch to an unproportional size and quantity bulk order discounts. You will get a preview of the change before you add it to your cart, and as always, feel free to ask for a free sample proof. View our ultra LARGE assortment of always in stock Vinyl Colors or order RAW vinyl straight off the roll for custom use, bottom layer of signage or front windshield banners and more. Use your imagination. Ten years worth of images! Send us your images. We'd love to see team pics, your rides, race cars trucks boats semi-trucks and vans, or any project that you had created with our vinyl decals--it doesn't have to be a "ride"! See our email address under the contact form on the site, and attach your image. Check it out. Myriad uses for your decals. They're not just signage for cars or trucks or boats or tractor trailers, but have many many uses. No limits! Visit our Customers Rides section to get some ideas and to see what many of our customers have done with the vinyl decals and graphics. Also see some examples of our Multi-Color Decals. Check out our Feedback section. See what our customers are saying about us. We appreciate all feedback and will continue to provide you with the best honest service we possibly can. Please feel free to Leave Feedback for any order you have received from us. We look forward to hearing from you and Thank you again! A tiny thank you for being a great customer and your order with us. We highly appreciate all of our customers. It is truly a pleasure to do business with you. We will continue to work hard for you and ship daily. FREE High Resolution Desktop Wallpapers. There are 500 cool unique designs to choose from. Up to five per customer please. Also enjoy the myriad of FREE Animated Gifs. We Use PayPal! PayPal Accepts All Major Credit Cards! Having a PayPal Account is Optional! Full Intensity Grafx is on Facebook! Click Here to Show Our Facebook Right Here! CHECK THEM OUT! TOP TEN CRAZY DECALS. (Nov, 11, 2018) From just plain absurd, to crazy, these "cool" decals made the top-ten. Check them out as I talk about each, how they got to even be created as a vinyl sticker, and what others think about these graphics. Vote, stupid, cool, or ludicrous: the TOP-TEN wildest decals, PLUS ONE EXTRA! You gotta see the "plus one" See the Top 10 wildest cool decals here! See how our customers are using their vinyl decals. (July 25, 2018) Check out the Customer's Rides and get creatively inspired. Discover ways to use vinyl decals. LOTS and LOTS of NEW items! (July 17, 2017) I've been very busy creating new designs, for decals and more. Check out the NEWS pages for full details about the abundance of new designs and products. New FLAGS and Decals! (June 21, 2017) New flag designs added as well as some wild new cool decals! Check out the NEWS pages for full details about the influx of ew arrivals coming. And as always, please let me know if there is something missing, anything you would like to add, be it decals designs, flags, family sticker ideas, whatever! THANKS! Be ROAD TRIP READY! (May 15, 2017) Summer is upon us! Get killer vinyl Custom Lettering Decals to keep them tailgaters at bay, or a Custom Family Sticker, be it naughty or nice, or just plain hillarious. Tons of decals to choose from, create your own, and plaster it on your back windows to yell to the world WHAT'S UP! Custom Sized Flag Decals (Nov, 07 2016) Order almost any size FLAG. Each Flag Decal is Much in Part Handmade Machine Die Cutting. Colors are Layered Vinyl for the Ultimate in Durability and Gloss that you can't get from Any Basic Printed Stickers. Get Your Custom Sized Flag Decals NOW AVAILABLE! They can be used for Trailers, Window Glass, Tailgates, Bumpers and just about any smooth surface. 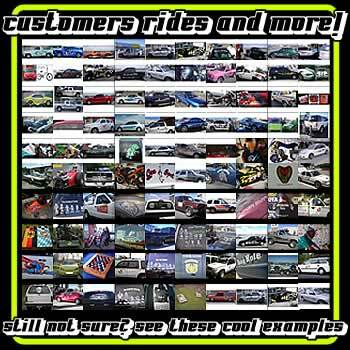 See our FAQ and Customer's Rides Section for more info. All decals are applied to the outside of a surface. Less Tax! (August, 29 2016) No more Texas sales tax! Great news for all of our clients from Texas! We will be paying your sales tax for the rest of the year! NEW! (June, 20 2016) Greater discounts for quantity in the Custom Lettering Decals section! Up to 45% OFF! NEW! (October 19, 2016) I added many really cool and funny new decals to the main graphics catalog today. You can also find all of the new decals on the What's New! page, part of the main graphics catalog. NEW! A new type of "In Loving Memory" Decal with Graphic and Theme Now a catalog of selectable designs that have graphics and themes. We still offer the very popular Personal Text Style In Loving Memory Decals also! Newly Added Today! 27 additional Family stickers added to the die cut stick figure style family decals page. NOW AVAILABLE! New items include Vampires, Werewolf, Aliens, Grandpa and Grandmas, New Dads and Moms, and more. New items show up first on the list when you choose the category, ie dads, moms, etc. See the NEW Family Stickers and Larger Thumbnail Pictures HERE! NEW! Larger thumbnail size so you can see the family sticker designs even better! NEW! ZOMBIE Family Stickers! I have 14 designs so far and available NOW here, Zombie Family Stickers I added 7 dads, 2 moms, 2 daughters, 1 boy and 2 pets, plus one sheriff and one evil rival. I had fun with these. I made one holding a chicken by the neck, LOL. Take a look, be the first in the world to have these one of a kind designs. I am planning to keep adding new ones throughout the end of this year. Soon when I get enough I'll make a zombie mode. For a really cool checkout and shopping experience try our new ZombieFamilyStickers webpage! New informational page! (Sept 11, 2014) How we make, ship, and pack the decals I put this page together because of wquestions about how we pack our decals. If you are interested in how we operate then this page is for you. IMPROVED! (Aug 19, 2014) The FAQ (Frequently Asked Questions) section of the site is completely rebuilt with more chelp to most common questions. I spent a few works working on it and it's finally done! I wanted to make the answers and helpful information very clear and easy to use. I hope you like it and find the information very helpful. NEW: Curlz Curly Style Monogram Decal: (Jul 25, 2014) New Curlz Curly Style Monogram Decal added to the Monogram Decals page. Available as a 2 letter monogram decal or a 3 letter version. NEW: "What's New!" page: (Jul 20, 2014) I just finished adding a new page to the site. It's pretty cool. Basically a "What's New!" page that shows the latest addtions to the main graphics catalog. Check it out! Why PayPal is so insanely SAFE to use! (Jul 01, 2014) We are proud to have used PayPal for well over 10 years as our main payment processor. Why you might ask? PayPal accepts all credit and debit cards as well as bank transfers. We have taken thousands of payments over the years with never a single security issue. Why you might ask, is it so safe? PayPal is one of the most secure sites on planet Earth. Sellers do NOT see your credit card information or even billing info. Any sensitive info is stored only with PayPal. The seller, which is me half of the time, at least when you buy decals, only sees your payment and "ship to" address, that's it! Also PayPal is great because it optionally allows you to have an account with them. You can fill it will funds and use PayPal to checkout at any site on the web with a couple clicks. No need for even a credit card. Safe, secure, and highly recommended by me. New Customer's Rides Pics! (Nov 21, 2013) I finally added the 2013 customers rides. Sorry so late, better than never. I hope you enjoy and thanks to my customers. I can make graphics and support my family without you. See em here! Testimonials (Oct 15, 2013) I added about 40 or so of my favorite customer emails. Emails that brightened my day as I read them. People who are more than just our customers but the life of our website and business. I want to express with all my heart, a huge thank you to all of our customers and I am so happy, that Lorena and I, can make you happy with our products and services. Read em here! New Family Stick Figures DECALS! (Oct 14, 2013) New Family Stick Figures DECALS! -Twin boy Peace sign -Twin boy thumbs up -Teen Hockey Boy -Beer Bonging Young Party Dad -I Love beer and Beer Belly Dad -Professional Photographer Dad -Simple Cheers Sode or Beer Dad with Cap -Bald Drinking DAd -Bald DAD with Parrot Bird -DAD with Parrot Bird -New Dog, Tongue Out! -Gramps in slippers and pajamas drinking beer/soda -Beer Bonging Young Party MOM -Piano playing MOM (Piano is a separate member so add it next) See em here! 21 MORE New Family Sticker People Added TODAY! : (Aug 27, 2012) More New Family Stick Figure Style Designs just arrived to the popular die cut family sticker section! I added 1 baby, 3 boys, 6 girls, 2 dads, 1 dog, 1 Grandpa, 3 cats, and 3 moms! I hope you like them! Note: These designs were added to the Stick Figure Style section, not the full color family section. I will try to add them to the full color section but this takes much more time. 78 New Full Color Family Sticker Designs: (Aug 7, 2012) I added a whopping 43 Moms, 13 Dads, 7 Dogs, 3 Girls, 3 Boys, 6 Grandparents to the full color style family stickers. Wheeew! A lot of work indeed and now my eyes are buggy...lol. These were designs that have been in the stick figure style section for a while, plus ones that were recently added on July 24th. They are now included in the full color style selection. Now both the popular one color style and the full color style family stickers should have the same amount of members. Remember that the full color style will have an alternative hair and skin color style after clciking on the member you choose. 21 New Family Sticker People Added! : (July 24, 2012) New Family Stick Figure Style Designs just arrived to the popular die cut family sticker section! I added 3 babies, 1 boy, 4 dads, 7 dogs, 2 Grandparents, and 4 moms! I hope you like them! Note: These designs were added to the Stick Figure Style section, not the full color family section. I will try to add them to the full color section but this takes much more time. 27 More....! : (Sept 20, 2011) I just finished adding anther 27 NEW Family Sticker Designs to the Stick Figure Style Family Stickers page. 27 NEW MOM FAMILY STICKER DESIGNS! : (Sept 8, 2011) You wanted em', you got em'. I just finished adding 27 NEW MOM Family Sticker Designs to the Stick Figure Style Family Stickers page. I also added 1 Granny, 1 Girl, and 1 Boy design! New designs will appear first in the selection. I hope to have them added to the full color family stickers section soon. NEW! : (Aug 10, 2011) Mongram Decals! More styles coming soon too. Check them out HERE: Monogram Decals and Stickers! NEW! : (Jul 27, 2011) Big changes to the GREEK LETTER DECALS page. Due to customer request I added functionality that allows you to purchase 2 or 3 letter decals. I also updated many other parts of the page and added a bigger discount for orders of over 20 decals, 70% OFF! DISCOUNTS! : Read entry on the news page for (June 09, 2011). Your one stop online decal store! Create a custom text decal, family sticker, or vehicle graphics and more online with this website. Preferred browsers for the best experience include The Google Chrome Web Browser and FireFox. For the best experience designing a custom lettering vinyl decal, or if you have any issues, Full Intensity Grafx recommends that you install either of those excellent web browsers. TIP:Did you know you can easily change the size of text and images on your screen when you are using the Firefox web browser. Simple hold the ctrl key on your keyboard and rotate the center mouse wheel. The size of everything on the screen will increase and decrease.